Pink and blue romance through the Gilded Age’s Asian textiles patchwork Lumbar pillow decorative pillow handcrafted from two Asian antique textiles combining floral silk cut velvet gaufrage in pink with chrysanthemums motifs and blue clouds. Late 19th century Asian textiles squares were stitched together to render a patchwork technique to modernize the designs and offer a geometrical look to the front panel of the throw pillow. These very soft velvets provide a very tactile experience to the luxury decorative pillows further embellished with a frame of A.T.G. custom orange flat silk trim all around. Backing with a burnt orange satin silk. Decorative pillow designed and handmade in the USA. Closure by stitch (no zipper) with a custom made pillow insert. Size: 12 x 20 x 6. Custom pillows made with pink and silvery gold Egyptian cotton by Mariano Fortuny. Neutral linen backs with self cording. Down inserts. 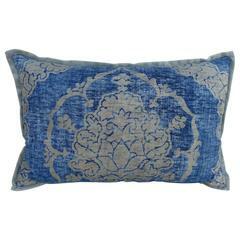 Blue and gray vintage Fortuny textile pillow with velvet back and self welt detail. Down insert, sewn shut. A vintage Guatemalan handwoven Huipil in red with multicolored accents. - Dong Indigo fabric on reverse, see image. - 75/25 goose feather and down inserts. - Concealed zipper. 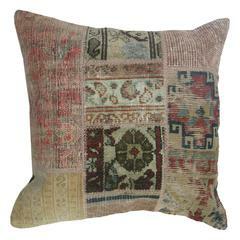 A pillow created from an assortment of vintage Persian, Turkish and Asian rugs. 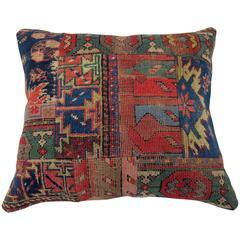 Pillow made from an assortment of antique Persian and tribal Caucasian rugs.